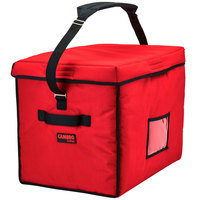 Cambro GBD211517521 Insulated Jumbo Red Stadium Delivery GoBag™ - 21" x 15" x 17"
Cambro GBTPLG110 GoBag™ Large Black Nylon Thermal Pad - 27 1/4" x 21 1/4" x 1 1/2"
Make sure your food delivery service is offering up piping hot pizza and wings or fresh cold subs and sandwiches, ready to eat at the ideal temperature, with the Cambro GBD211517521 21" x 15" x 17" insulated jumbo red stadium delivery GoBag™. This Cambro GBD211517521 21" x 15" x 17" insulated jumbo red stadium delivery GoBag™ will ensure that your signature food remains at an ideal temperature from the kitchen to the front door of your customers. 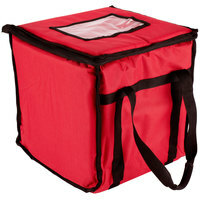 This bag is made of a sturdy nylon fabric lined with high-density, recycled PET insulation to keep your offerings hot and delicious. A nylon carrying handle and heavy-duty sewn-in straps are able to support the weight of a full bag and provide a comfortable grip. 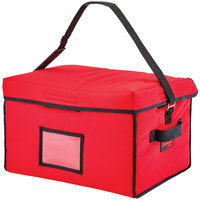 This bag also folds flat for easy storage and closes securely with an extra long hook and loop fastener. Plus, this bag includes a ticket pouch to hold tickets and receipts, as well as pockets for condiments, coupons and utensils. 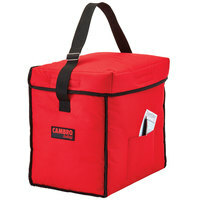 This Cambro GoBag™ is made of a durable 900-denier nylon construction with a high-density, recycled PET (polyethylene terephthalate) liner to keep your food well insulated. These materials will protect the quality of your food and ensure that it retains its dine-in freshness throughout the delivery. 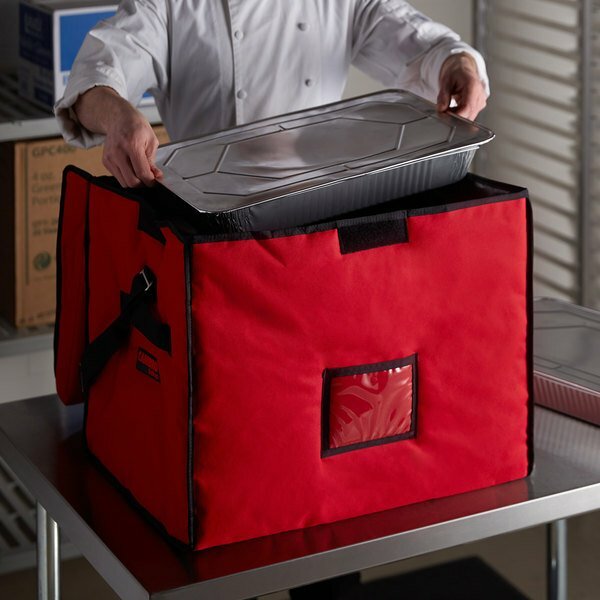 This bag offers superb breathability, allowing for small amounts of moisture to escape to prevent sogginess and keep food crisp. It will help boost delivery your sales while holding up against the wear and tear of everyday use. 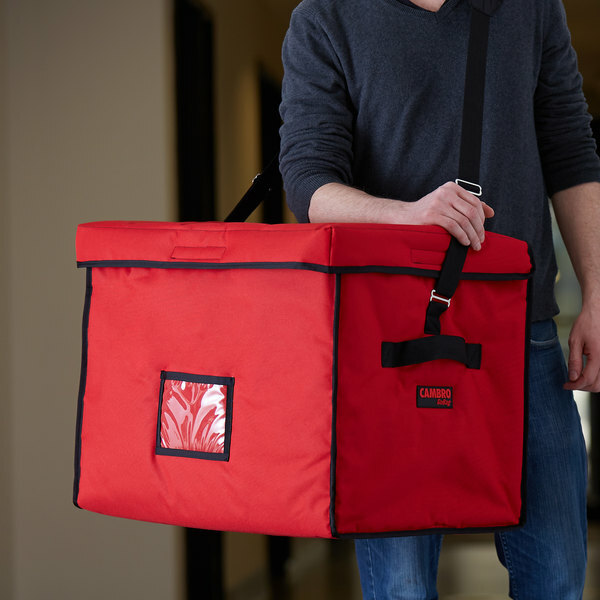 The GoBag™ features sturdy nylon straps and a carrying handle. These are more than able to support the weight of a full bag while providing a comfortable grip for the user. Because they are sewn-in, these straps and handle prevent tearing and ripping, reducing the risk of dropping the bag and spoiling its contents. 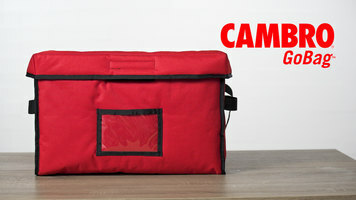 This bag folds down completely flat, taking up minimal space when not in use and making storage a breeze. 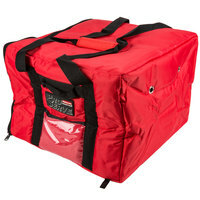 It is built with an extra long hook and loop fastener to make sure your delicious pizzas and sandwiches stay in place for the duration of the delivery service. 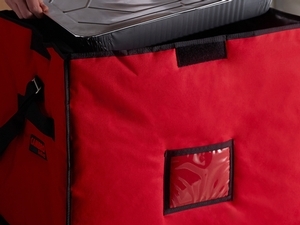 This secure closure also ensures optimal heat retention. The GoBag™ features a convenient ticket pouch that is perfect for holding order tickets and receipts, ensuring that these important items are not misplaced in transit. 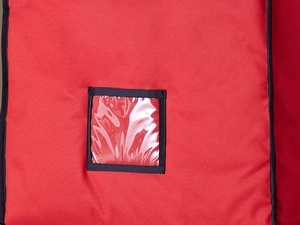 Multiple pockets are also built into the bag. 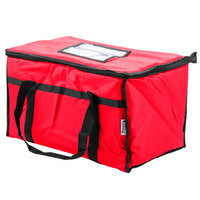 These can be used to hold condiments, coupons, and even utensils, allowing your delivery employees easy access to everything they or a customer might need. 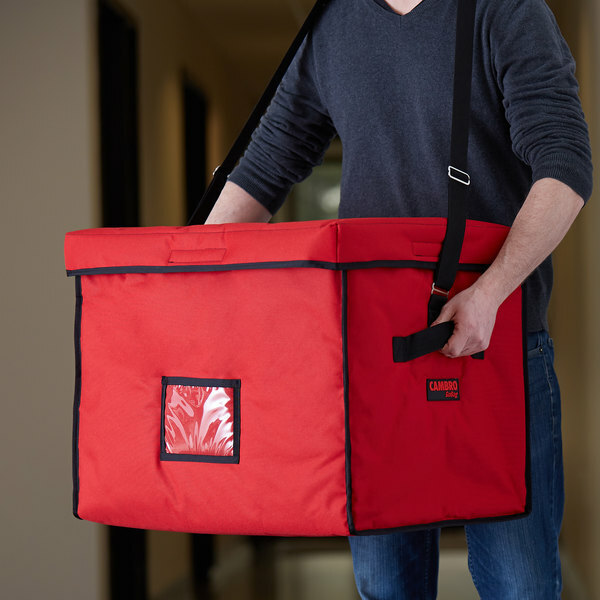 Item #: 214GBD2115RD Cambro GBD211517521 Insulated Jumbo Red Stadium Delivery GoBag™ - 21" x 15" x 17"
Item #: 124FCARRRD Choice Insulated Food Delivery Bag / Pan Carrier, Red Nylon, 23" x 13" x 15"
Item #: 214GBD1391RD Cambro GBD13913521 Insulated Red Small Top Loading GoBag™ - 13" x 9" x 13"
Item #: 214GBD1814RD Cambro GBD181412521 Insulated Red Jumbo Delivery GoBag™ - 18" x 14" x 12"
Item #: 6909F38 Rubbermaid FG9F3800RED ProServe Insulated Delivery Bag Medium Pizza / Catering / Sandwich Bag Red Nylon 17" x 17" x 13"
Cambro GBD13109521 Insulated Red Small Delivery GoBag™ - 13" x 10" x 9"
Cambro GBD181412110 Insulated Black Jumbo Delivery GoBag™ - 18" x 14" x 12"
Cambro GBD211414110 Insulated Black Large Delivery GoBag™ - 21" x 14" x 14"
Cambro GBD13913521 Insulated Red Small Top Loading GoBag™ - 13" x 9" x 13"
Cambro GBD211417110 Insulated Black Large Folding Delivery Bag GoBag™ - 21" x 14" x 17"
Cambro GBD181412521 Insulated Red Jumbo Delivery GoBag™ - 18" x 14" x 12"
Cambro GBD13913110 Insulated Black Small Top Loading GoBag™ - 13" x 9" x 13"
Cambro GBD101011110 Insulated Black Small Folding Delivery GoBag™ - 10" x 10" x 11"
Cambro GBD151212521 Insulated Red Sandwich GoBag™ - 15" x 12" x 12"
Cambro GBD211517110 Insulated Jumbo Black Stadium Delivery GoBag™ - 21" x 15" x 17"
Cambro GBD121515110 Insulated Black Medium Folding Delivery GoBag™ - 12" x 15" x 15"
Cambro GBD13109110 Insulated Black Small Delivery GoBag™ - 13" x 10" x 9"